🇬🇧A quick and easy, not cooking recipe to give you some much needed energy before or after a workout. And they keep in the fridge for a couple of weeks, although they are so yummy they won’t last that long. In a food processor mix dried apricots, almond butter and melted coconut oil, pulse it a bit before adding chia seeds and ground almonds. 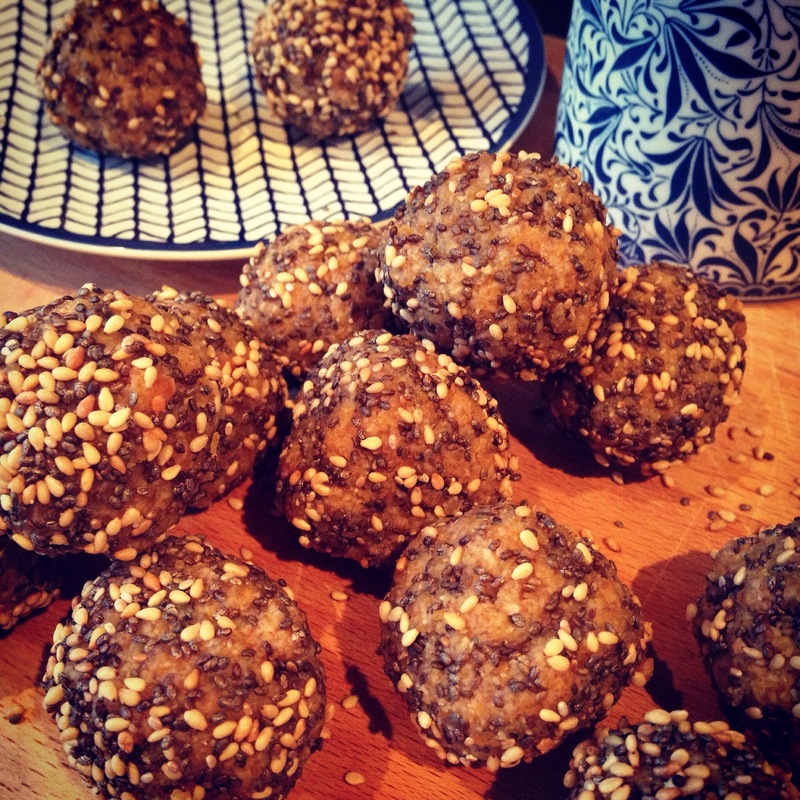 Shape into balls and roll in chia and sesame seeds. Leave to cool in the fridge and should be ready to eat in two hours. 🇪🇸Una receta rápida y fácil que no necesita cocinar que te dará la energía necesaria antes o despues del gimnasio. Y las puedes tener en la nevera dos semanas, aunque estan tan ricas que no duraran tanto. En un robot de cocina añade albaricoques secos, mantequilla de almendra y aceite de coco derrerida, mezclalo un poco antes de añadir las semillas de chia y almendras molidas. Prepararla masa en forma de bola y cubrelas con semillas de chia y sésamo. Dejalas en la nevera un par de horas y listas para comer. This entry was posted in cakes, catering, cooking, desserts, eating out, fitness, food, food, gluten free, gym, health, home, home cooking, kitchen, nutrition, raw food, restaurants, small kitchen appliances, snacks, vegan, vegetarian, workout, World Food and tagged gym, nutrition, raw, snack, vegan, workout. Bookmark the permalink. Thank you! They taste lovely too! !